Welcome to the fourth edition of PuzzleNation Blog’s newest feature, 5 Questions! And I’m excited to have Robin Stears as our latest 5 Questions interviewee! Robin is a puzzle constructor whose crosswords appear not only on her StearsWords site, but have also appeared in Penny Press/Dell and Kappa titles as well as the Los Angeles Times. Her puzzles are clever and topical, often striving to add new entries and wrinkles to the field of crossword construction and cluing. Robin was gracious enough to take some time out to talk to us, so without further ado, let’s get to the interview! Crossword puzzles and word games have always appealed to me, and after my first daughter was born, I was looking for a way to work at home. My mom suggested the idea of constructing crossword puzzles, since I’d been killing time solving them while I was wondering what to do. Armed with a stack of dictionaries, graph paper, and pencils, I created a puzzle, and typed it on my mom’s typewriter, and colored in the black squares with a marker. I sent my first puzzle to Janis Weiner at Kappa, who promptly sent it back with a bunch of notes. I’m very grateful to her for taking the time to explain what I did wrong. It’s because of her I decided to try again. She rejected most of my puzzles at first, but she always explained why. I consider her my mentor, but she probably doesn’t know that. 2.) You recently constructed a puzzle utilizing that most infamous of cinematic weather phenomena, the sharknado. You have a knack for releasing topical puzzles steeped in pop culture. Is this more a case of keeping your puzzles fresh (since so many crosswords slip into archaic terms and dated references), or of you constructing the kinds of puzzles you’d enjoy solving? It’s a little bit of both. I think language is fluid and crossword puzzles should reflect that. For example, the word “inception” wasn’t quite as popular in everyday conversation prior to the 2010 movie release as it is today. I don’t know about other constructors, but I find it very satisfying to be the first to use a new word in a crossword puzzle; I suspect they do, too, as evidenced by the number of times ZZZQUIL was used in puzzles when that product was introduced. The fandom crossword puzzles were born from a comment I saw on Tumblr; someone complained that there weren’t any fandom puzzles. It occurred to me that the only specialty puzzle — where all the clues refer to a single theme — was the Bible puzzle, probably because there are nearly 600,000 words in it. There are about the same number of words in the Lord of the Rings books, though. Nearly every fandom has a wiki, and a plethora of trivia websites, and by exploring them — along with the Internet Movie Database, Wikipedia, Reddit, and other sources, I was able to create several puzzles specifically for certain fandoms, including both Star Wars and Star Trek, “Adventure Time,” and “Doctor Who.” There is so much information online, that I was actually able to create the “Doctor Who” puzzle without having seen a single episode! My younger daughter’s a big fan, though; she inspired the “Adventure Time” one, too. They also allow me to pay homage to the things I love, like Stephen Colbert, Syfy movies, Donkey Kong, and the US Postal Service. Every constructor’s style is a little different, and like most solvers, I have my favorites — Liz Gorski, Tyler Hinman, Brendan Emmett Quigley, Merl Reagle, Matt Gaffney, Trip Payne, and of course, Patrick Blindauer, whose dollar bill crossword puzzle is my personal all-time favorite. We all put our personal stamp on the puzzles we create. But, the modern crossword puzzle is about to turn one hundred years old, and if they’re going to remain relevant in the modern world, they have to change and adapt to suit younger solvers. That means constructors need to use the Urban Dictionary as well as Webster’s. 3.) You’re also a published author with several titles to your credit. How does the creative process for writing a book compare to that of creating a crossword? Writing fiction and writing crossword clues are completely different processes. A novel is a long, leisurely cross-country trip, while a crossword clue is a quick peek around the corner. It took me about a year to write each book, after researching it for months, and another six months of editing. Crossword puzzles may take anywhere from an hour to a day to complete, depending on the size and the theme entries. In the past few years, partly for the instant gratification, partly because it’s more lucrative, and partly because it’s more fun, I’ve concentrated more on crossword puzzles, although I do have another novel I intend to finish. 4.) What’s next for Robin Stears? Well, there’s that novel… eventually. In the meantime, I’d like to attend more puzzle events, like Lollapuzzoola and the American Crossword Puzzle Tournament. Last year, I volunteered at my local tournament, and it was fun meeting the participants and discussing the puzzles they’d solved — there’s no substitute for immediate feedback. Solving crosswords is very different from constructing them. I have a database at my disposal, and I have great respect for solvers who have to remember all those clues! I’d like to meet the constructors I admire to exchange ideas and hear their stories, and Amy Reynaldo and Kathy Matheson (Crossword Kathy), whose blogs are so informative and whose ideas and opinions I respect — it’s because of Amy’s “Diary of a Crossword Fiend” blog that I removed certain words from my database, like APER. I’d love to finally meet the people behind PuzzleNation, Cruciverb, Sporcle, and Quinapalus, and all the other puzzle-related sites. Constructing crosswords is a lonely business — I need to get out more. The fandom trivia puzzles are a challenge, so you’ll probably see more of those. Fans of “Breaking Bad” will see a special puzzle at the end of September for the final episode, and baseball trivia fans can expect their puzzle in October, during the World Series. For Halloween, I’m planning a horror movie puzzle, and of course, I’ll do something for the 100th anniversary of crosswords in December — I’m open to ideas for that one. Ben Tausig recently pointed out in an article in “The Hairpin” that there seem to be fewer women constructors, and I’d love to help remedy that. When I first started, twenty-odd years ago, constructing a crossword puzzle was difficult and time-consuming — these days, most constructors use software with a built-in database of words and clues. My personal choice is Crossword Compiler. I think anyone with a basic knowledge of the rules and a bit of computer savvy could create and publish a crossword puzzle. I believe there’s plenty of room in the crossword puzzle world for new constructors with new ideas. Technology and the opportunities for puzzle creators and solvers to interact with one another will change the ways crosswords are created. I had a lot of help in the beginning, and I hope to pay it forward to the next generation of crossword constructors. When I construct a crossword puzzle, I always have the fans in mind. I want to create a solving experience that’s fun and enjoyable for them. The entire time I was constructing a special “420” puzzle, which, to my knowledge, had never been done before, I was imagining how surprised and delighted some puzzle solvers would be that week. And like the Super Bowl puzzle and the Harry Potter puzzle, I knew that not everybody would appreciate it, but the ones who did would appreciate it all the more because I constructed it especially for them. When I construct puzzles for Penny Press/Dell, I also have a certain fan in mind — someone who enjoys an easier solve, with a little less pop culture and a little more word play. No matter which publisher I’m targeting, I’m always thinking about the puzzle solvers and what they might enjoy. Frequently, I construct customized crossword puzzles as gifts; they’re always a big hit because they’re personal. So, my advice is this: Tell me what you want! Send me an email, tweet me, write on my Facebook or Google+, hit me up on Blogger or Tumblr — StearsWords is not hard to find. I maintain a variety of social media because I want puzzle fans of all kinds to interact with me. Much of my day is spent scanning social sites like Twitter, Pinterest, and Reddit and reading puzzle blogs, trying to find out what kinds of topics might interest puzzle solvers. Anyone can send me an idea for a puzzle, and if I like it, I’ll do my best to make it happen. I’d rather give puzzle fans what they really want than give them what I want them to have and hope they like it. Many thanks to Robin Stears for her time. 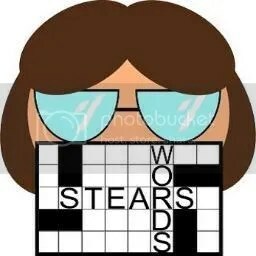 Check out her StearsWords puzzles on her website, and follow her on Twitter (https://twitter.com/RobinStears)! I can’t wait to see what puzzly goodness she cooks up for us next. This entry was posted in PuzzleNation, Puzzles and tagged 5 Questions, American Crossword Puzzle Tournament, Amy Reynaldo, Ben Tausig, Brendan Emmett Quigley, Crossword Kathy, crosswords, DIY puzzling, Elizabeth Gorski, Geeking Out, interview, Janis Weiner, Lollapuzzoola, Los Angeles Times, Los Angeles Times crossword, Matt Gaffney, Merl Reagle, Patrick Blindauer, Pop culture, Puzzlin' fool, Robin Stears, Sharknado, Stears Words, StearsWords, Trip Payne, Tyler Hinman, Wordplay by gmdirect. Bookmark the permalink.